Since we had to suffer through several straight days of 100F+ weather, I was determined to make a batch of ice cream to combat the heat. 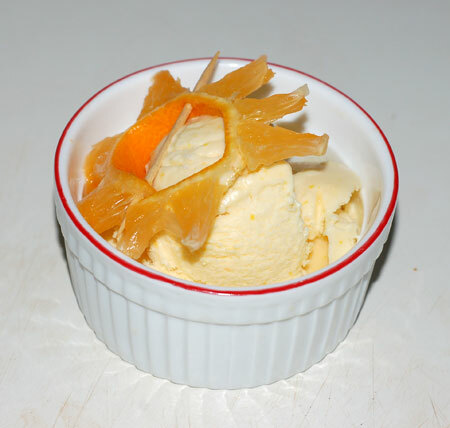 The Orange Popsicle ice cream from The Perfect Scoop was the perfect candidate for several reasons: It gave me a means to use up a big bag of sweet little clementines I’ve been trying to eat single-handedly for several weeks; it called for half-and-half and sour cream, both of which I was able to run to our little corner market and pick up in a matter of minutes (they don’t carry whipping cream); it is a blender recipe, which is awfully convenient for chilling and later pouring into the running ice cream machine; and most importantly, it isn’t a custard-based recipe, which means no heat required! I was a fan of orange creamsicles growing up, and with my addition of vanilla extract (the original calls for orange liqueur, which is not my thing), this recipe matches that flavor beautifully, with a creamy texture and refreshing hit of citrus. I predict that this ice cream won’t last the weekend in our fridge. But I have to admit that I actually liked the textural contrast of crunchy orange popsicle and creamy vanilla ice cream in the original treat, so I’m also tempted to make plain vanilla ice cream sometime and top it with orange granita to get that citrus crunch. In a blender, pulverize the sugar together with the zest until very finely ground. Add the remaining ingredients and blend until the sugar is entirely dissolved. Chill thoroughly in the refrigerator before churning in your handy-dandy ice cream maker. Source: Slightly adapted from The Perfect Scoop , by David Lebovitz (p. 50). This sounds like the perfect treat to beat the heat! I haven’t had a creamsicle in ages, and I’m pretty sure I’d love it in ice cream form! This sounds really good! I would love some. May I have some of your hot weather to go with it!